As always we are aiming to ensure that thousands of children in Manchester and Salford will make many happy memories this Christmas. This Christmas we are appealing for donations of new toys and gifts as well as treats such as selection boxes and advent calendars. The presents are new so every child is made to feel like any other when opening their presents on Christmas morning, and unwrapped so that parents and carers can come and select the gifts themselves in the run up to Christmas. Manchester and Salford combined have over 48,000 children living in poverty, with families struggling each day to make ends meet, many of them in low paid and insecure work. The festive season in particular can be a real struggle for many parents. Not only is there the expense of presents and a Christmas Dinner, there is also the extra costs of providing meals for their children, when they might normally receive free school meals during the week. Families living in Manchester and Salford can be referred for help this Christmas by a professional who knows the family’s circumstances well. All services are free for families to access and further details can be found here. We rely greatly on support from the local community who organise collections of toys or simply add an extra item to their own shopping in the run up to Christmas. Local companies and manufacturers have been fantastic with donations of presents and many are showing their support through social media and helping highlight the cause by using the hashtag #woodstreetxmas. 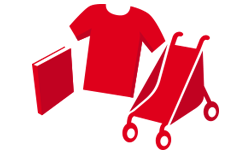 One of our major supporters this year is hosting company UKFast who is throwing its weight behind the appeal. Not only will they be acting as a drop off point for donations, they will also be providing advertising support to help deliver the biggest campaign we have ever seen. 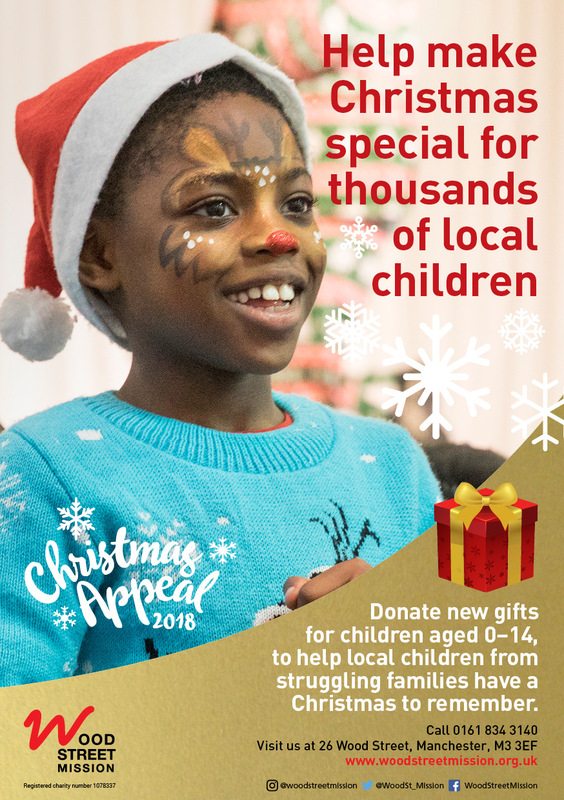 From Monday 12th November, commuters and the local community will be greeted by the Wood Street Mission Christmas Appeal 2018 advert displayed on the 35 ft billboard directly outside UKFast’s Headquarters on Princess Parkway in Hulme. Des Lynch, Manager of Wood Street Mission said: “Every year the level of support we receive from our local community is outstanding. We are incredibly grateful to UKFast for their generosity throughout the year and their ability to place our name in lights really is the icing on the cake. This level of profile places our Appeal right at the heart of the business community and alongside their willingness to share our cause across their networks, it’s going to make for a very exciting Christmas and enable us to help more children this Christmas. The Appeal runs until 14th December. Donations can be dropped off at our headquarters on Wood Street, off Deansgate in central Manchester Monday to Friday 8.30am – 4.30pm or at the offices of UKFast 8.30am – 5pm. If you wish to know more about the appeal or how you can donate please call 0161 834 3140 or head over to our Christmas page.